Stripes are one of my all-time favorite patterns for workout pants. When I saw these contender tights from Athleta, they had my name written all over them. I purchased these in XXS, my usual size in Athleta. In my opinion, they fit true to size. The fabric is mid-weight with good compression. The compression feels similar to lululemon’s luxtreme. The fabric feels slightly thicker than luxtreme; I wouldn’t wear these on hot summer days. The feel is slick and smooth, not cotton-like. The stripes are a deep navy blue, not black. The rise is on the high side with plenty of coverage. The front sits just a little bit below my belly button. 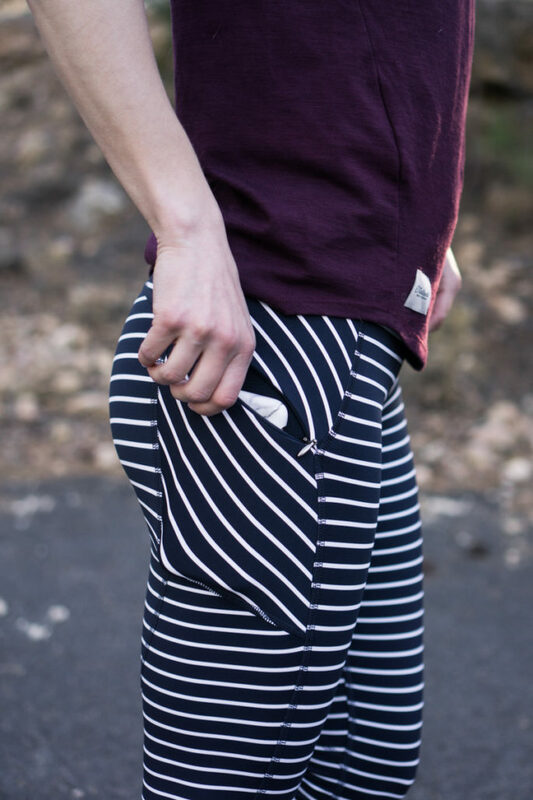 They hit at the perfect spot above my hips so the waistband sits totally smoothly–no squishy bits. These are billed as 7/8 tights and they sit exactly at my ankle with no bunching at all (I am 5’3″). On top of that, the leg opening fits snugly around my ankle. Baggy ankles are a huge pet peeve of mine (and very common due to my height), so I absolutely love how cleanly these fit through the lower leg. Note that my tights are the regular length, not petite as my size is not available in petite length. Unlike a lot of printed fabrics, these stripes do not fade to white when stretched. The inside of the pants is the same fabric as the outside, which makes the color come through strongly. They are completely opaque even in a full squat. Hooray!! Both sides are equipped with a zippered thigh pocket. I have a slight preference toward simple slit pockets for ease of access, but the zip isn’t a big deal. Note that the pocket extends upward above the zip, too, so if you have a large phone, you can tuck the top flap over it for extra security. My iPhone 7 fits perfectly inside. I took these for a couple of runs around town and they performed perfectly. They stayed right in place and held everything in (including my phone!) perfectly. These pants have everything you want in a pair of high-impact workout tights: comfortable fit, supportive, opaque, and flattering. Adding to all that, at $89, they’re priced a little bit less than similar tights from other brands like lululemon. They are absolutely worth the price. One of my best buys in a long time! These earned my highest recommendation. You can pick up a pair online from Athleta or pop into your local store. 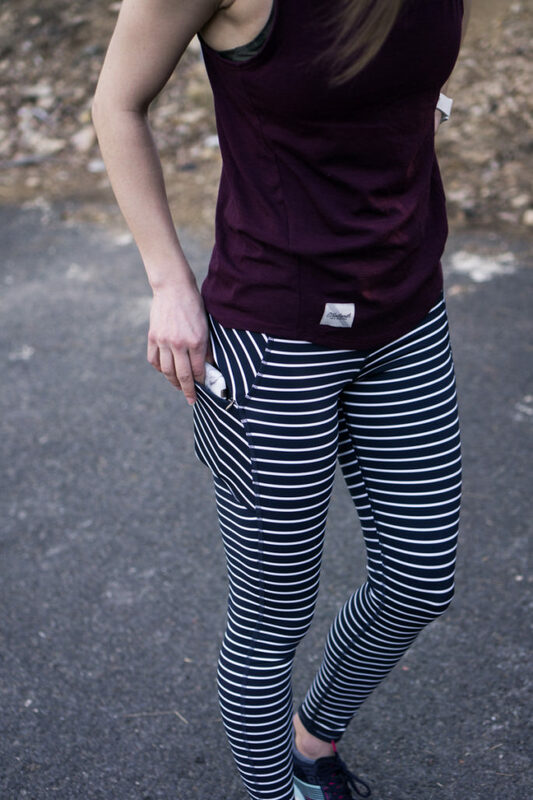 If you’re not a stripes fan, there’s a whole bunch of other colors and prints in the contender tight! Do they have the drawstring? These look amazing on you!! I ordered them and absolutely loved them but unfortunately the stripes messed with my eyes/made me nauseous. I must be super sensitive to the white/dark stripe patterns:( Same thing happened with with the parallel stripe Wunder unders. I too found no show of the unders and pattern to be super flattering. They also felt very comfortable on with great fabric. Hello from Burnaby, BC…where my closest Athetla store is in Seattle, WA. =‘( I totally want to order those bottoms online!! What Athleta size would I be if I am consistently a Lululemon size 4 in bottoms? I am a size 6 according to their size chart (5’2”, 34-27-37, 125#), but I actually wear size 4 crops & tights because size 6 slides down even when I am walking! I would get a small. I’m a consistent medium and wear a size 6/8 lulu. Just to add a little more info, I wear a 2 in lulu and imo the Athleta XXS fits the same. :) Hopefully you can find a perfect fit with minimal hassle! Hmm, maybe I’ll order XS then…if it’s too tight, more motivation to lose weight lol! I’m also consistently a Lulu 4 with wide hips & narrow waist and I bought these in a S.
Thx! Do they stay up? I haven’t exercised in them yet, but they feel like they will! And if it’s any consideration, I’m 5′-0″ and bought the SP. I also tried the S in regular length but they felt like they were ever so slightly less fitted in the legs, and seemed to be about 1/2″ longer. Thanks for the review! I definitely don’t need any tights right now as we head into warmer weather, but I like that these don’t have the baggy ankle problem. I will definitely keep that in mind!